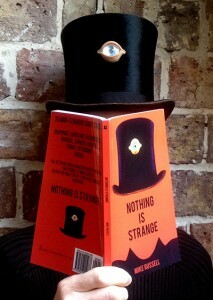 Mike Russell is the author of ‘Nothing Is Strange’, a collection of 20 mind-expanding short stories that have been described as: ‘Inspiring, liberating, otherworldly, magical, surreal, bizarre, funny, disturbing and unique’. He is the founder of StrangeBooks and is based in Brighton, UK. Characters are forms that hold aspects of the inspiration. Stay true to yourself and enjoy the process. Creative freedom is a wonderful, precious and important thing; self publishing offers that. Increasingly author led, which means increasingly inspiration led, which means less market led.